Creative Assembly did its best to give one fan a special day, and you'll see the result in-game. When Creative Assembly first announced Total War: Rome 2, it promised "colossal armies rendered in incredible detail." For one gamer's family, that incredible detail has special meaning: James, a 24 year old Total War fan and liver cancer sufferer, visited the studio, eager to see the latest developments in the series he loved. 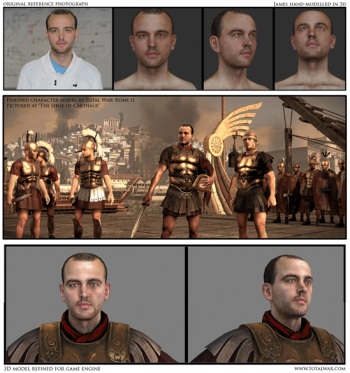 His likeness lives on, in-game, as a soldier in the Siege of Carthage; James died shortly after his studio tour. It had all been arranged by Willow, a charity that organizes Special Days for the seriously ill. "What really struck me was how my colleagues reacted to James coming in," said community manager Craig Laycock. "I was inundated with emails offering help with James' day. The tour organized itself, as the guys around me scrambled to show James what's going into making Rome 2." James got to play an early build, and talked to pretty much everyone involved in the game's development. "He asked passionate questions," Laycock reminisced, "and offered clear and concise suggestions on features for the game." "He will live on in some small way in our game," Laycock said, "and every time I see him I'll be reminded of what a great guy he was." Total War: Rome 2, the latest in the Total War RTS series, is due for PC later this year.